Right, I’m going to start blogging regularly again without having to wait to write a New Year’s resolution to motivate me! I think one of the reasons I am blogging less is because of the way all the mainstream parties have coalesced in the centre ground, which has resulted in a very dull political landscape in Britain. This has been ongoing since the early 1990s with the speed of dullness being turbo powered by Tony Blair’s Government and obsession with focus groups. It is only in the last five years the status quo is being punctured by UKIP and previously (albeit on a much lower scale) by George Galloway’s Respect party. Melanie Phillips, the Times columnist, summed it up well on the BBC’s Question Time last night when she said the problem was a lack of leadership. So true – leadership is vitally important as it gets things done. This is the case everywhere not just in politics – look at how Tesco has fallen to its knees since Sir Terry Leahy stepped down as CEO to be replaced by the now defunct and hapless Philip Clarke. The difference between Nigel Farage, the Respect leader and Messrs Cameron, Clegg and Miliband is the UKIP and Respect leaders have a set of principles and they are not afraid people will disagree with them, as they believe they are right and want others to follow them. Political leadership can move countries and the world: Margaret Thatcher and Ronald Reagan undoubtedly had it. Many would say Tony Blair had it too – but did he? Mr Blair actually achieved very little himself as he admits in his autobiography, A Journey, – ironically, it was Gordon Brown who did the most change in implementing a client state paid off in benefits and tax credits and unleashing the banks to fund his spirally welfare coffers and public sector wages bill. Those were highly destructive actions but it required thousands of civil servants to implement them, which required leadership. Tony Blair may have had the brightest smile but it was Gordon Brown who was actually running the Government between 1997 – 2007, which made it even more ironic he failed so spectacularly in the most senior position when he became prime minister. But where is the leadership now? A photo on a popular right-wing political blog (displayed above) struck me today as encapsulating the political class who follow rather than lead. 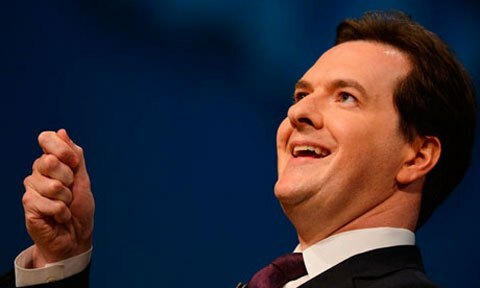 One Gideon Osborne is doing his best to look like Tony Blair – not in any sense of mockery but because of admiration – even down to the thumb on top of hand gesticulation, which Blair mastered so not to be all ‘pointy’ in his speeches, which the professionally offended would find, well, so offensive. And why has the Submarine Chancellor surfaced today: to announce a lack of leadership. The EU have sent us a bill for £1.7bn. Two weeks ago David Cameron went to Brussels and enacted a faux anger over the bill, prodding his finger on the lectern to make his point, almost knocking it off the stage into the press pack. The anger was not real – David Cameron is from aristocratic stock: the first thing mother says to you when you are born into the aristocracy is: “Never get angry”. Emotion is treated as wrong by the upper-class, which shows you what an actor David Cameron has become. Just like a Mr T. Blair. Leadership is not acting – that’s following someone else’s script, in this case UKIP’s. Now Mr Osborne claims to have cut the ‘surprise’ bill in half. But has he? The small print tells us differently – the EU will use Britain’s rebate to pay off the rest. So the money we get back each year (although we still plough into Brussels £6bn more than we get out each year!) is being used to pay this new bill. So the Chancellor hasn’t reduced the bill at all. And who secured the annual rebate: one Margaret Thatcher. It takes leadership to make a real difference. Categories: Politics | Tags: David Cameron, Ed Miliband, EU bill, George Galloway, George Osborne, leadership, Melanie Phillips, Nick Clegg, Nigel Farage, Question Time, Respect, UKIP | Permalink.